Judith Merril – The Future is Female! 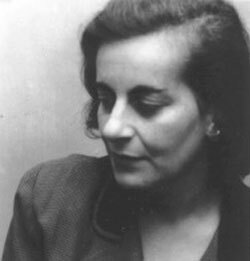 Judith Merril (January 21, 1923–September 12, 1997) was the principal pseudonym under which Judith Josephine Grossman published stories, novels, and criticism beginning in 1947. Born in Boston, she moved to the Bronx after her freshman year in high school; her father Samuel Solomon (“Shlomo”) Grossman, a columnist and drama critic for a Yiddish newspaper, had committed suicide when she was six, and her mother Ethel (Hurwitch) Grossman had accepted a job running a settlement house for juvenile offenders. Graduating in 1939, she met Dan Zissman at a Trotskyist Youth picnic the following year. They married and in 1942 had a daughter, Merril, who was raised during her infancy on military bases across the country. Moving to Greenwich Village after the war, Merril became one of the few female members of the Futurians (the men included Isaac Asimov, James Blish, C. M. Kornbluth, and Frederik Pohl; other women included Leslie Perri and Virginia Kidd); she published a science fiction fanzine, TEMPER!, and contributed two stories under her married name to Crack Detective. Separated in 1946, she turned to writing and editing to support herself and her daughter, working briefly for Bantam Books and selling more than a dozen sports stories, under the pseudonyms Eric Thorstein and Ernest Hamilton, to pulp magazines. 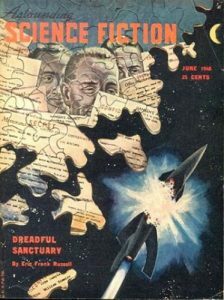 Her first science fiction story, “That Only a Mother” (Astounding Science Fiction, June 1948), was her first publication as Judith Merril and was written to win a bet with science fiction editor John W. Campbell, who claimed that women couldn’t write science fiction good enough to appear in Astounding. Not only did Merril win that bet, but “That Only a Mother” has gone on to be one of the most widely-anthologized science fiction stories since its initial appearance. Merril collected her subsequent short fiction in Out of Bounds (1960), Daughters of Earth (1968), Survival Ship and Other Stories (1974), and The Best of Judith Merril (1976). Her first novel, Shadow on the Hearth (1950)—adapted for television in 1954 as Atomic Attack—was followed by The Tomorrow People in 1960. She also wrote two novels in collaboration with C. M. Kornbluth, “Gunner Cade” and “Outpost Mars”; both appeared in 1952 under the joint pseudonym Cyril Judd. Along with these works, Merril was a prolific reviewer and edited sf anthologies including Shot in the Dark (1950), England Swings SF (1968), and the annual series S–F: The Year’s Greatest Science Fiction and Fantasy (1956–68). Married to Frederik Pohl from 1948 to 1953, Merril had a second daughter, Ann, in 1950. She later cofounded and served on the board of the Milford Science Fiction Writers’ Conference (1956–60) and in 1960 married union organizer Dan Sugrue, separating three years later. In 1968, after a year in England, she immigrated to Canada, joining the staff of Rochdale College in Toronto and helping to organize the Committee to Aid Refugees from Militarism (CARM). Her private book collection, donated to the Toronto Public Library in 1970 to form the “Spaced Out Library,” became the nucleus of the Merril Collection of Science Fiction, Speculation, and Fantasy, now numbering over 70,000 volumes. She died in Toronto of heart failure the same year she became a Science Fiction and Fantasy Writers of America Author Emeritus. Her posthumously published autobiography, Better to Have Loved (2003), earned a Hugo Award for Best Related Book, and in 2013 she was inducted into the Science Fiction Hall of Fame.